Never Give Out Your Real Life Address Online, 12 Year Old YouTuber Swatted - KABALYERO - PLAY, BLOG & EARN! 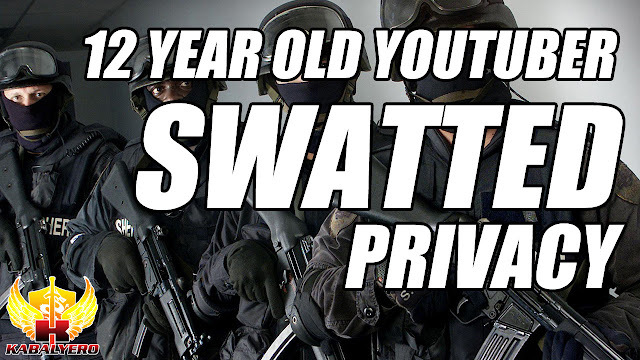 A 12 Year Old YouTuber was Swatted after getting tens of thousands of subscribers in YouTube. Just recently, I came upon a story in MMORPG.com about a Swatting incident involving a 12 Year Old boy in YouTube who gained tens of thousands of subscribers after getting a Shout Out from a popular YouTuber. According to the story and I quote, "The boy was playing a match with another YouTuber with over 800k subscribers. This YouTuber sent his fans to the boys channel which raised the latter's numbers from about 400 followers to over 85k. Apparently this didn't sit well with some folks." What happened next was, armed Police Officers came to the boys home after receiving a call telling them that the boy and his mother were going to commit suicide. Obviously, this incident caused the boy and, I guess, his family a lot of grief and it happened because someone who is sick in the brain thought it was a funny thing to do. So guys, if you are putting yourself online then I strongly suggest that you keep your Real Life Address or Location private and never use your Real Life name because there are a lot of sick, demented and twisted people out there. Keeping your Personal Information private is a good way of keeping yourself safe both online and offline. So guys, my question is this, what are your thoughts about this whole Swatting thing and how do you keep your Personal Information from leaking online? Post your answers as well as your comments, questions or reactions in the comments section below and, as always, if you are lagging badly in your favorite online games then why not give WTFast a try.